Vegetation often modifies the intensity and distribution of precipitation falling on and through its leaves and woody structures. The most obvious effect plants have on falling precipitation is interception (Figure 8k-1). Interception can be technically defined as the capture of precipitation by the plant canopy and its subsequent return to the atmosphere through evaporation or sublimation. The amount of precipitation intercepted by plants varies with leaf type, canopy architecture, wind speed, available radiation, temperature, and the humidity of the atmosphere. Figure 8k-1: Vegetation can intercept up to 50% of the rain that falls on its leaves. 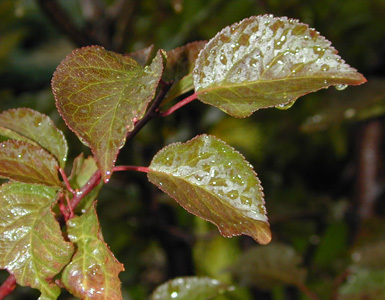 The leaves of deciduous trees commonly intercept anywhere from 20 to 30% of the falling rain. Water dripping off leaves to the ground surface is technically called leaf drip. Stemflow - is the process that directs precipitation down plant branches and stems (red arrows in Figure 8k-2). The redirection of water by this process causes the ground area around the plant's stem to receive additional moisture. The amount of stemflow is determined by leaf shape and stem and branch architecture. In general, deciduous trees have more stemflow than coniferous vegetation. 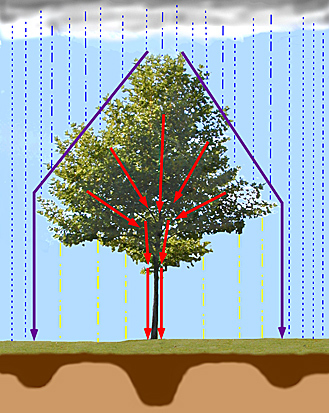 Canopy drip - some plants have an architecture that directs rainfall or snowfall along the edge of the plant canopy (purple arrows in Figure 8k-1). This is especially true of coniferous vegetation. On the ground, canopy drip creates areas with higher moisture content that are located in a narrow band at the edge of the plant canopy. Throughfall - describes the process of precipitation passing through the plant canopy (yellow dashed lines in Figure 8k-2). This process is controlled by factors like: plant leaf and stem density, type of the precipitation, intensity of the precipitation, and duration of the precipitation event. The amount of precipitation passing through varies greatly with vegetation type. Figure 8k-2: Modification of falling precipitation by vegetation The relative quantity of precipitation entering the soil is indicated in dark brown.